What Job Interview Question Should You Ask? Ask the right job interview question in your interview and get ready for success. One of the easiest ways to win in the interview is to prepare a list of good interview questions to ask the interviewer. Asking thoughtful and well-researched questions during your job interview makes a great impression. You demonstrate your interest, initiative and strategic understanding of the position and the company. You show the interviewer that you have spent some time thinking about the job and the company. Use the opportunity to ask focused job interview questions. Show that you are better prepared than the other candidates, use your questions to highlight your suitability for the job. Don't rely on the interviewer to ask you the "right" interview questions, take control of the discussion by asking the job interview question that you have researched and prepared. Ask interview questions that show how hard you have thought about the position and the company and how serious you are about the job opportunity. We help you to plan interview questions that go beyond just exploring the routine details. These questions focus on aspects such as role expectations, job priorities, departmental and organizational strategy and needs, management style and expectations. A key aspect of asking the right job interview question is good background research. Use your research to understand as much as possible about the organization and its situation, the position and its priorities. 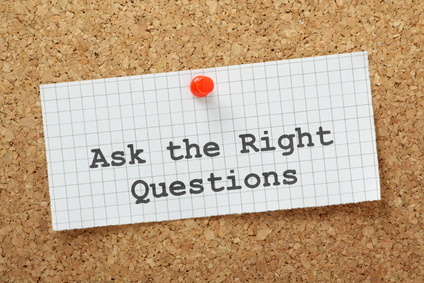 Prepare questions to ask in the interview that demonstrate this knowledge and insight. Go to job interview information to find out how to do the necessary background research before your job interview. 3. When should I ask my interview questions? The timing of your interview questions should be thought about. The interviewer will ask you at some point, "Do you have any questions for me?" You can wait for this opportunity to ask your planned questions or you can assess the situation as the interview progresses to decide when it is a good time to ask your question. If the interview is not flowing smoothly asking an appropriate job interview question can improve the flow of the interview and help build rapport with the interviewer. 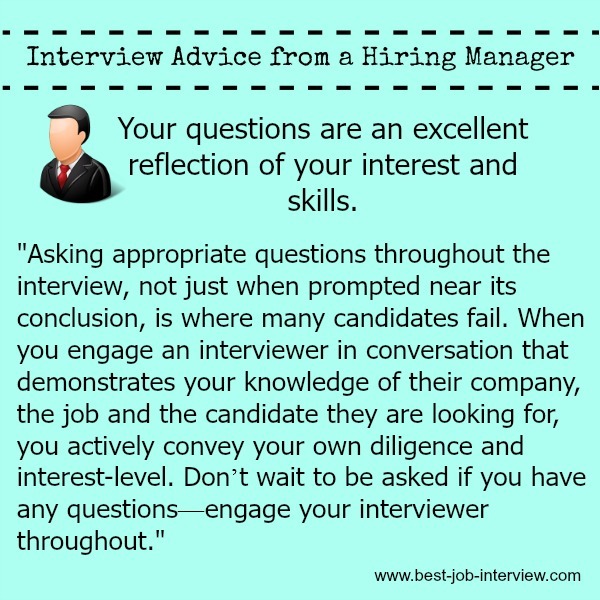 If the interviewer doesn't directly ask you for your questions take the opportunity towards the end of the interview to offer your questions: "Is this an appropriate point to ask you some questions I have?" 4. How many questions should I ask? This depends on the level and complexity of the job opportunity and how much information you have on the company. Try to have a list of 5 to 10 questions prepared that you can choose from as the interview progresses. 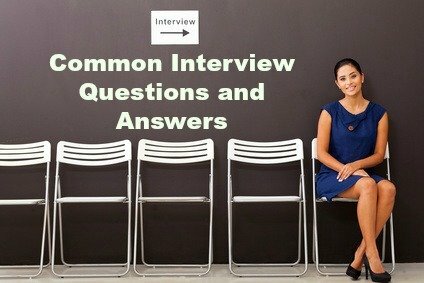 Interviewers want candidates to ask enough questions during the job interview to collect the necessary information to make a good decision on accepting a job offer. Focused, open-ended questions help you come across as a resourceful candidate who is able to gather enough information to make a well-informed decision, an essential job competency. Nothing frustrates an interviewer more than asking a candidate if they have any questions, only to be told, "No you have answered them all already." Go through the recommended job interview question to ask about the job itself, the management, the organization and, very importantly, what questions not to ask during the interview! List of interview questions not to ask Avoid asking these questions in your interview. Prepare your own list of about ten questions, review the list a number of times before your job interview and be prepared to impress! Be ready to answer typical interview questions. These are the top 10 interview questions that you are likely to face in your job interview. Interviewers will ask a number of common job interview questions to assess the candidate's suitability for the job. Use the sample answers to help prepare your own interview answers to these standard questions. If you have conducted an informational interview about this type of position and the industry, use the information you collected to help you prepare the questions to ask in your interview. Have your interview questions ready and impress as a professional and well prepared candidate for the job opportunity.